Paso Robles, CA: After a one-year hiatus, Firestone Walker Brewing Company’s seasonal Oaktoberfest makes its packaged return this month in a dashing new 16-ounce can format. Oaktoberfest is a “Paso Märzen Bier” made to honor the classic Märzen style while exhibiting just a hint of extra West Coast hoppiness. All of the ingredients are sourced from Germany, including Vienna and Pilsner malts as well as Hallertau Tradition hops. Oaktoberfest is a seasonal offering for late summer and fall, and will be available in all Firestone Walker markets starting in mid August. While Oaktoberfest has long been a fall staple at the brewery, this latest release marks only the second time it has been packaged. 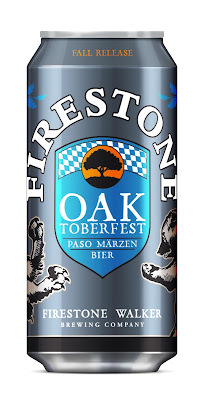 The name Oaktoberfest is a nod to the brewery’s hometown of Paso Robles—Spanish for “Pass of The Oaks”—as well as the longtime presence of oak barrels as a central part of the Firestone Walker brewing operation. The checkered blue and white pattern on the label echoes the Bavarian flag and pays homage to the Oktoberfest style. Also on the homefront, the third annual 2016 Madonna Inn Oktoberfest presented by Firestone Walker Brewing Company takes place on October 1 in San Luis Obispo. As always, Oaktoberfest will be racked to oak barrels and ceremonially tapped to punctuate the festivities.